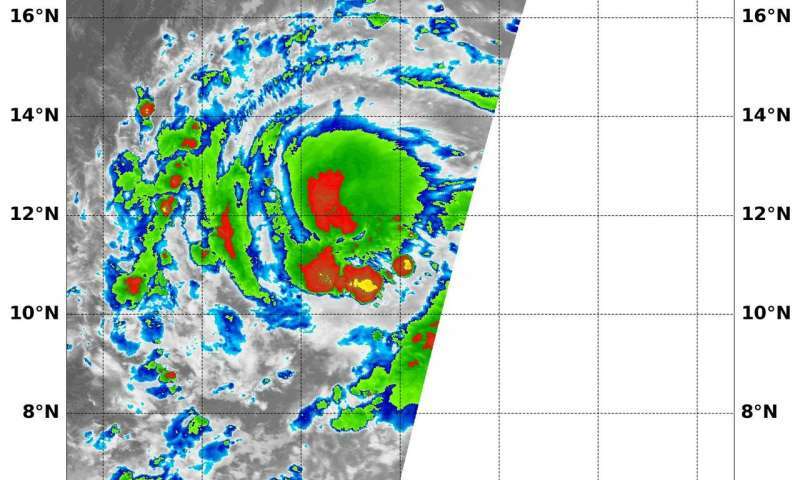 The National Hurricane Center noted that Tropical Storm Sergio was on the verge of becoming a hurricane in the Eastern Pacific Ocean and NASA's Aqua satellite confirmed very powerful storms within. Infrared satellite data captured at 5:30 a.m. EDT (0930 UTC) on Oct. 1 from the Moderate Resolution Imaging Spectroradiometer or MODIS instrument aboard NASA's Aqua satellite revealed strongest storms with the coldest cloud top temperatures west of Sergio's center and in a band of thunderstorms southwest of the center. MODIS found coldest cloud tops had temperatures near minus 70 degrees Fahrenheit (minus 56.6 degrees Celsius). NASA research has found that cloud top temperatures that cold have the capability to generate heavy rainfall. At 11 a.m. EDT, the National Hurricane Center or NHC noted, "Sergio is almost a hurricane. Satellite images indicate that the central convection has been increasing in intensity during the past several hours, but there are still no indications of an eye in that data. Microwave imagery does show an eye feature, however. The outer bands are not particularly well organized, and there are some dry slots beyond the inner core." The center of Tropical Storm Sergio was located near latitude 11.5 degrees north and longitude 109.5 degrees west. Sergio is far from land, so there are no coastal advisories in effect. It is about 625 miles (1,000 km) southwest of Manzanillo, Mexico. Sergio is moving toward the west near 14 mph (22 kph), and this general motion is forecast to continue through tonight. A turn toward the west-northwest is expected on Tuesday. Maximum sustained winds remain near 70 mph (110 kph) with higher gusts. NHC noted that "Strengthening is expected during the next 48 hours, and Sergio is forecast to become a hurricane later today, and a major hurricane by Wednesday, Oct. 3."